It is school holidays here by us (Western Australia) and for now I love having my two home! They are both a little bit under the weather but with movies keeping them occupied, I have some time to work on this week's posts! I used StazOn Jet Black Ink to stamp on the Vellum, it dries quickly on a non-porous surface. To add dimension I cut a few extra layers Designer Series Paper with the Bold Butterfly Framelits. Rich Razzleberry ink and the Pink sequins from the Love Blossoms Embellsihment Kit add a pop of colour to the Black and White card! A little bit of Metallic Gold Thread adds some extra sparkle. As easy as that! As always I welcome your feedback! Thank you for playing at Global Design Project this week. Beautiful card, Melodie! I love the monochromatic appeal of this butterfly-filled card. 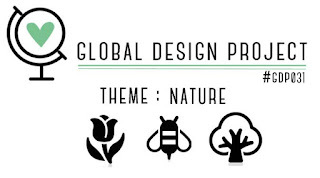 Thank you so much for playing along with this week's Global Design Project theme challenge. Thank you so much for your comment Cheryll! A beautiful card! I am loving it! Thank-you for playing along with the Global Design Project - Krista (from Canada). Thanks Krista! Looking forward to casing your card this week!